There’s a big difference between creating branded content and building a content brand. Branded content is egocentric brand marketing. Developing a content brand takes an audience-first approach to business storytelling that builds a loyal audience. Deloitte Debates is branded content (notice how the brand is in the title of the content). Will it Blend? is a content brand (see how there’s no mention of the Blendtec brand in the title?). The most successful business storytellers build content brands — not branded content. Instead of thinking like a marketer, try thinking like a television producer. Myles is the CMO of CommCreative and the president of the Boston chapter of the American Marketing Association. But I didn’t know any of that before I built a relationship with his content brand. Let me explain. Every weekday, Myles posts an article branded as Today’s Marketing Cookie on his company’s blog. 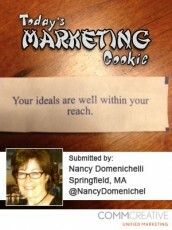 People from around the world send him photos of fortunes they find in fortune cookies. Each day, Myles reflects on a fortune and connects it to a marketing lesson. He also includes a picture and brief bio of the person who submitted the fortune that he’s been inspired by (a perfect example of using brandscaping to leverage the audiences of others). Myles has set himself up with a simple challenge, and it works. I know exactly what to expect every time I receive his weekly recap: five intelligent blog posts that leverage fortune cookie aphorisms to teach me a marketing lesson. Since Myles started writing Today’s Marketing Cookie, traffic to his blog has increased 924 percent. More importantly, Myles’ content brand has helped him build a powerful list of 3,500 loyal subscribers. I’ve recommended Myles’ content to other marketing professionals because it’s so easy to understand. His content brand is easy to share. It’s intriguing and interesting. It’s a twist on the all-too-familiar and inconsistent marketing advice you get on other corporate blogs. Myles leverages his content brand to elevate his advice above the noise of commodity content. Myles’ content is so easy to share, more than 29,000 people have passed it along via Twitter, Facebook, and LinkedIn (if he was to buy that traffic at an average of $2.50 a click, he would have had to shell out more than $120K). The super-cool fold of the week! Moving your business storytelling away from branded content and turning it into a content brand also moves your content from a marketing expense to a content asset. It allows you to treat your content as a product: a product that can drive revenue in its own right (not to mention drive sales). For example, Trish’s videos have opened the doors to additional revenue streams based solely on the brand status as the folding expert, which she’s earned through her weekly series. She conducts workshops (which also drive revenue); she’s even been hired as a spokesperson (wearing her funny T-shirts) for other related brands in the marketplace. Treating your content as a brand in-and-of-itself, turns your marketing expenses into financial assets. Tell that to your CFO. What if you turned a fortune into a relevant lesson for your audience every day? What if you created a “Super Cool ______ of The Week” series? What would your content brand look like? Want to build a content brand in an afternoon? I’m lucky enough to have been invited to host a workshop at Content Marketing World this September. If you’re interested in building your own content brand in an afternoon, check out this three-hour workshop: Launch a Killer Content Brand in an Afternoon.